Composting is a great way to not only manage food waste and keep it out of landfills; it’s also a great source of fertilizer (for all you gardeners). All it requires is a little space in your yard, and some elbow grease (actually, it isn’t that hard to take care of). 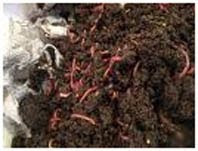 This is a specialized form of composting in which you feed your food scraps to worms in a box. Now some people might be grossed out by worms ( I don’t know why), but they are the easiest, quietest, and frankly, most useful pets one could have. Like regular composting, its all natural, and is a great source of fertilizer. The only catch is that worms are, for the most part, vegeterians, so no leftover burgers and steaks for them! This one might be difficult, as yes, meat can be delicious and does have its benefits. However, the ways in which meat is mass-produced in the United States is not only cruel, inefficient, unhealthy and messy; it is also super wasteful. We feed cows way more corn and grain than we feed actually people, and to add to that, we need to feed them antibiotics so that they don’t become ill and die from being fed grains (meds that people could use!). Farm animals, through manure and gas emissions contribute tones of methane and nitrous oxide, which happen to be two of the major greenhouse gases that are contributing to climate change. Just not eating meat 2 days a week can make a difference. Hope these tips go to good use!